The system is based on a single, extensive construction that comprises all tables for discipline, gender and age. The choice of the first parameter is co-determinative for the final one. No artificial intervention is applied anywhere. 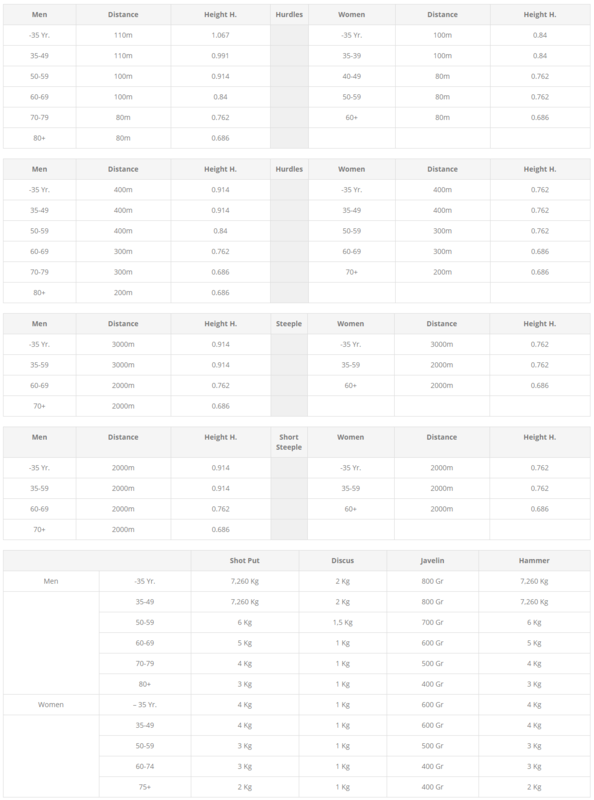 The tables with associated parameters and coefficients are therefore applicable for single-event performances and for multi-event performances for men, women, seniors and masters and provide absolutely reliable results. Regardless of the category that a participant falls under, a single final ranking can be prepared for both, the best competition performances and for a multi-event performance comprising any number of tests, and from junior classes through to master classes up to 95 years of age. The correct male/female balance is also statistically achieved. For various reasons, it was not possible to use existing tables as the basis. The difficulties included the fact that they did not match the rationality that served as our only guide for creating an extremely reliable working instrument based on a plethora of statistical data. That was possible by means of a precise analysis and critical application of the annual performance lists found in the ‘International Track and Field Annuals’ by Peter Matthews. We used no pre-prepared, estimated or theoretical maximum or minimal value and most definitely no hypothetical musings. The relevant WAVE regulations were borne in mind at all times for the Masters’ categories. Due to the original and innovative methodology used, including the construction of relationships rather than using naked figures, modifications will not be necessary in the future, barring the admission of revolutionary new techniques (e.g. the flop) or equipment (e.g. the fiber pole). In that respect, it will be possible to enter any changes required, but only after at least 5 years of study of any new annual lists for the disciplines concerned. All technical details are available on request. The determination of the 1,000 point and 0 point values in our tables is done according to mathematical statistical principles and is a common thread running through all of the disciplines. Due to the study of the masters’ performances, a biological component is also included that makes a seamless transition possible between all of the age coefficients from 30 to 95 years old. The 0 point values for the senior men are always equivalent to the 1,000 point values for the 95-year-old Masters. The same applies to the women, although a corrective factor was applied due to a different aging pattern starting at 45 years of age. In our construction, the progression parameters, which were derived data in the existing tables, played a primordial role. They have been determined mathematically from the statistics data and related to one another. To be able to apply it to all disciplines, the base coefficient for the 100 m run had to be high enough, i.e. 684. Correct 1,000 point, 0 point, and progression values, used judiciously, are the basis for our construction. The world records do have a role here, but only a modest one. That makes it possible to calculate them correctly. The sober rationality according to which we have built our system is clear from the extremely simple graphical representation: 4 analogue, continuous and smooth curves, along which the base values of each male/female discipline and, after applying the age coefficient, every age, as well, are entered. Due to the fact that the curve is already very steep at the 1,000 point level, for reasons of straightforwardness, a straight line was opted for above that level. The possibility of absurdities entering the system has been eliminated well into the future. Regardless of your age and gender, you can compare the value of your performance with those of a senior or with those of any other athlete of any age. You can see your annual progress (or regression) clear and thereby adjust your target performance level precisely. You can easily determine what your best event is or what your best-ever performance was. Older hurdles competitors should not be shocked that their ‘corrected’ time is suddenly higher than their actual performance time: the system automatically reverts to the base distance and hurdle height! Discipline, age, and gender are automatically configured at start-up for the 100 m run for men under 31 years old. The desired discipline, age or gender can be selected with the mouse cursor. Entering the time/distance is done by overwriting the values shown. After pressing the ‘Calculate’ button, the points and the actual value is calculated and shown on the screen. After pressing the ‘Clear’ button, the form is reset to the starting values. (100 m, men, < ’31’ years) When only one or two parameters have to be changed for a subsequent result, it is not necessary to use the ‘Clear’ button. After having changed the desired parameters, pressing the ‘Calculate’ button will provide the new result. A result obtained can be frozen by selecting ‘Calculate Time/Distance’. In that position, the result can be compared with every conceivable combination. You are a 58-year-old man and have run 100 m in 13.88 secs. The result is 666 points and the real value (Real Value) is 11.90 seconds. You then select age ’59’ years, ‘Calculate Time’ and then press the ‘Calculate’ button. Next year, you will have to run the same distance in 13.99 seconds to achieve an equally good performance. The points result does not change. This is undoubtedly an outstanding aid in trying to improve your performance! You want to know how far a 40-year-old woman should jump to equal your performance of 666 points. Select gender ‘Female’, followed by the event ‘Long Jump’. Leave ‘Calculate Time’ unchanged, set age to ’40’ years old and press ‘Calculate’. The distance that you are looking for, 5.26 m, is shown on the screen. The RealValue is also shown: 5.72 meters. The sequence of the selections is not very important as long as no parameters are forgotten. a 40-year-old man will have to jump 6.11 meters in order to equal your result. In ‘Age’, change the age to 80 and press ‘Calculate’. Then you know immediately that if you jump 3.30 m when you are 80 years old, you will be performing at the same level as your 100 m run today. To summarize: in the position ‘Calculate Points’, you can calculate all performances; in the position ‘Calculate Time/Distance’, you can compare all performances. By setting the programme to ‘Calculate Time/Distance’ and entering a given point value, you can set minimum levels for participation and/or awarding medals for all events and all age categories. The Hurdles and Steeplechase events are configured for the following distances and obstacle heights, which have been included in regulations since 2008. The results will only be correct if these values are used on the course.